The Berkhamsted Local History & Museum Society would not exist without the dedication and support of experts, enthusiasts and volunteers. Here is a gallery of some Society committee members, followed by biographical notes of our now-retired Chairman Jenny Sherwood, Les Mitchell and Michael Browning. Mary Casserley was born and bred in Berkhamsted, to a railway and brewing family. She has a beer bottle from the Locke & Smith Brewery where her great great grandad worked. Her grandad, ‘Jock’, can recall riding with his grandfather on a horse and cart, delivering barrels of beer to the Officers of the Inns of Court Who were stationed in Kitchener’s Field during the latter years of the Great War. An accomplished artist, Mary published her book of drawings of Berkhamsted High Street in 2002, and “Postcards of Berkhamsted, 1902-1945” in 2012. Many people will recognise her latest paintings of the Chilterns which revisit “a classic era of Railway poster design, recreated in the vibrant tones of 1930s travel art”. Jenny was born in Hampstead in the last month of King George V’s reign, the second of five children. Her father worked for Barclays Dominion Colonial & Overseas Bank in West Africa. Shortly after her birth he transferred to the Inspection Department in order to spend less time abroad. The family moved first to Edgware and then to the outskirts of Rickmansworth; it was here the war years were spent. One of her most vivid memories of those times was seeing the glider that had come down whilst on the way to Arnhem. In the kitchen of the home was a large map, on which her father marked the battles of the War. He himself was in the Home Guard, having served in Mesopotamia during WWI. When Miss Henning closed her little school, Jenny joined her elder brother as one of the few girls at his Prep School, which had moved out of London to Hertfordshire’s countryside. At the age of seven she went to school in Watford, travelling on the LMS line from Rickmansworth, long since closed. She has memories of lessons in the coal cellars during air raids at the time of the doodlebugs. After school, she read History at Bedford College for Women, London University. After university Jenny went to Manchester University and trained to be a Teacher of the Deaf. Her sister was born deaf as a result of maternal rubella. Jenny regrets now that she did not go on first to do historical research, but her work in the field of deafness brought her a wider experience of life and gave her opportunities that the purely academic field would never have done. In 1959 Jenny met Ken, a chartered accountant, on a walking tour in Wales; they were married in February 1961 in Watford. In August 1969 they moved to Berkhamsted with their three children and immediately became very involved in local affairs. In January 1970 Jenny joined the Berkhamsted & District Local History Society and has been a member ever since. She became Chairman of the National Council of Women (Berkhamsted) and was invited to be Chairman of the Herts Association for the Disabled, Berkhamsted branch. After the youngest child started school, Jenny became a county advisory teacher with responsibility for Dacorum, a post she held for 20 years. This gave her the opportunity to extend her geographical knowledge of the County. Retirement was the signal for Jenny to return to historical research and writing. She joined the Committee of the History Society and in 1999, became Chairman, and shortly after Jenny became a director of Dacorum Heritage Trust and Chairman of the Education sub-committee. The Museum Trust and the History Society merged to become the Berkhamsted Local History & Museum Society. The Society has long been striving to have more information available for visitors to Berkhamsted Castle. Together with the Castle Liaison Group and Berkhamsted Town Council this has now come to fruition with the opening of the Castle Visitor Room. Once again the Castle has gained the prominence it deserves. Jenny has contributed to many historical journals, including the Bulletin of the Tewkesbury Historical Society, The Chronicle and other local publications. She wrote the text for Berkhamsted—a Celebration and History and part of the Castle booklet. She also wrote a chapter on Berkhamsted for the book A County of Small Towns: the development of Hertfordshire’s urban landscape to 1800. 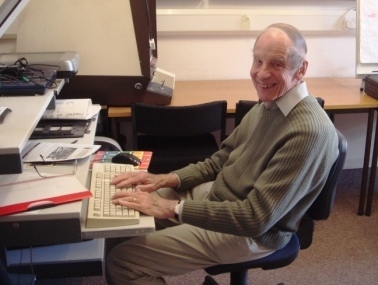 Michael Browning, honorary life member, served for many years as a most efficient Membership Secretary until his death in June 2013. Michael came to Berkhamsted in 1991 on his marriage to Ann and immediately immersed himself in Berkhamsted’s history. 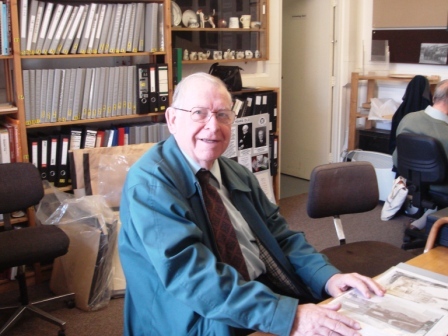 He worked in the Museum Store every Wednesday and was among the first to master the intricacies of the MODES system (Museum Object Data Entry System). He was actively involved in the surveys of the Berkhamsted gardens in the 1990s. At the opening of the exhibition: Les Mitchell, Michael Browning, Jenny Honour, Jimmie Honour, Antony Hopkins, John Pitkin, Jenny Sherwood and Eric Holland.